We often scribble down informational, inspirational, and innovative musings pertaining to the Outdoors and Yoga. The Queen's Garden, Navajo Loops, Sunset, and Sunrise Trails get all the praise in Bryce Canyon National Park, but we prefer a lesser traveled trail called the Fairyland Loop. This 8-mile trail is arguably the most scenic day hike in Bryce Canyon, and we love that also has fewer crowds for those looking for an adventure without the traffic jam. You will start to notice a series of rising traverses that proceed counterclockwise around Boat Mesa. As you continue you will be surrounded by plenty of trailside hoodoos (freestanding pinnacles that will make your jaw drop like a 90s cartoon character). Make sure your camera is ready to snap some great shots of these beauties. From the eastern end of the loop, you will follow a gradual climb back up to the rim near Fairyland Point. Make sure you take plenty of water (1-2 liters for every 2-3 hours of hiking per person, the hike takes approximately 4-5 hours on average. ), sunscreen, snacks, and wear a hat to protect your face. If you need a shuttle back to your car it is free with your National Park entry fee. The shuttle runs from Fairy Point and Sunrise Trailheads (9 a.m. to 6 p.m.) approximately every 15 minutes from the end of May until the end of September. Want to get more tips on hiking, travel, camping, and mobility? Make sure you follow us on our instagram @camp_asana and facebook group Camp Asana. The idea of traveling thousands of miles in nature where the sunrise and sunset are your clocks and your internal drive is your alarm clock sounds incredible. With books like Wild by Cheryl Strayed and Bill Bryson's A Walk in the Woods, it's not a wonder more people are feeling the call to leave their job, sell possessions and take to the open trails. Completing a thru-hike will certainly leave a profound impact on your life. Many have only been able to describe it as, "transformative". You will spend months connecting with nature, building your endurance capacity, and developing friendships with some of the most incredible adventures along the way. Finding the courage to take the journey for some seems like the hardest part, but actually, there are some challenges our expert thru-hikers thought would be critical for you to know before you head out on the trail. 1. The first tip, SQUIRREL, no we don't mean have a short attention span. We want you to gather information like a squirrel stocking up for winter. Many first-time thru-hikers believe their experience will be an extended version of their backpacking trips. The last thing you want to do is be caught off guard on the trail because you didn't take the time to do your research. Reach out to other thru-hikers by searching things like #thruhiker on Twitter or Instagram. Follow blogs by the Big Three Thru Hike Organizations: Appalachian Trail Conservancy, the Pacific Crest Trail Association, or the Continental Divide Trail Coalition. These are great resources to start your trip planning. In fact, many of their resources include trip planning. Part of your research would include self-evaluation of your physical preparedness. To get better at hiking, start planning longer hikes. Never gone solo? Practicing smaller excursions prior to your thru-hike will be incredibly helpful in understanding how you deal with solo trips and if you want to reach out to other hikers or complete a thru-hike with a partner or team. While the imagery of Reese Witherspoon traveling the Pacific Crest Trail in the movie Wild feels like enough butane to fuel your camp stove, many people setting out to complete a thru-hike don't make it the entire way. But if you are determined to make it to the very end you should probably know some of the common pitfalls others have fallen into so you can make a plan to avoid an incomplete trek. While hanging out around the campfire drunk of the sugar rush of your s'mores it's easy to romanticize the idea of thru-hiking. But the actual hike will take many months of continuously challenging work. Come into this adventure ready to push your edge. Thru-hiking is tough on your body, and even tougher on your brain. There will be times where you’re exhausted, sore, hungry, cold, filthy, and wet. There will also be times where you’re homesick, lonely, and bored out of your mind. It takes mental fortitude not to give up in those moments. This is an area where planning is key. Everything from falling behind on your planned hikes and overspending on unexpected expenses (see next pitfall) can cut your hike short. Thru-hiking puts an incredible amount of stress on your muscles, bones, and joints. It’s critical that you take excellent care of your body while you hike. With the right training, preparation, and daily stretching you’ll keep your body running strong. Injuries and illnesses that take weeks to heal will likely end your trip early. Sometimes life gets in the way of a thru-hike and there’s nothing you can do about it. The trail will be there waiting for you when you’re ready to get back on it. 3. Define your success -- that's right not everyone sees completion as the success. This is perhaps our 15 years of fitness coaching coming into play, but what is your "WHY" statement. You need to really evaluate what your reasoning for being out on this journey is and how you will know if you were successful. For some it's about self-exploration and for others it might be just overcoming the physical challenge. Make a clear, measurable definition of your success. It will help you on the days that really challenge your sanity. 4. Drop Weight -- in your gear. People pack like they are on an extended backpacking trip without really evaluating the weight of what is on their back. Many first-time thru-hikers abandon unnecessary gear within the first week. Completing your through hike is not about brute strength, it's about efficiency. The less weight you have to carry the more efficiently your body can move. Not to mention, you will reduce the amount of muscle and joint fatigue. This is invaluable for your thru-hike success. 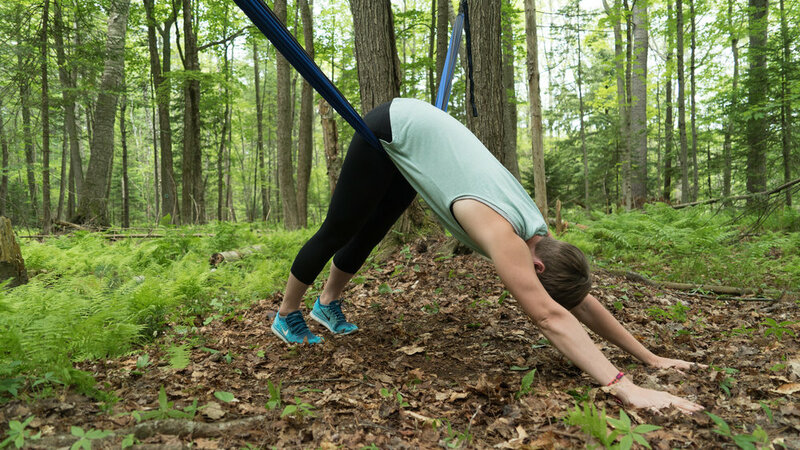 You knew you wouldn't get tips from Camp Asana without us reminding you of the importance of self-care. From your tired feet to your aching shoulders, you need to spend a little time recovering your body. Stress injuries are common with long distance hikers and a few stretches to target your calves, quads, and hamstrings each morning and evening can impact your experiences. 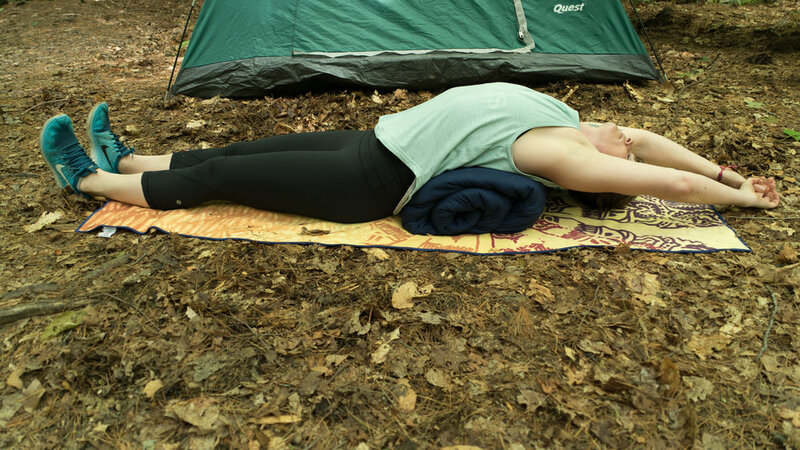 It's easy to neglect these stretches when you are tired, but that's why we have an entire video series on backpacking equipment uses for your restorative practices in the backcountry. Check out how to use your equipment to help keep you strong. These 5 Tips are not all-encompassing by any means, but they are insightful pieces of information to get you thinking about your first Thru-Hike. Make sure to follow us on social media for more tips, humor, and movement advice and adventures. Share this post if you find it helpful for other adventurers to experience. I'm Kirsten Beverley-Waters, aka WildLeigh Waters, founder of Thryve Fitness + Yoga + Wellness. I have spent more than 15 years in the fitness, yoga, and outdoor industry. Errr okay so not so much in the industry as actively participating as a consumer and observer of all those in the industry. Find me in trees, climbing over mountains through 6 feet of snow, and even lacing up the shoes for a trail race with an average 14% grade (did I mention the last 1k is a 48% grade). My point is that I am taking my study of anatomy, physiology, sports, yoga, meditation, and recreational sport and bringing it into the wilderness. Literally. I am helping merge worlds of Yoga + the Great Outdoors together. And I hope you will join me! So let's talk a little more about Camp Asana so we can get you checked-in. Welcome to Camp Asana Yoga in a Backpack. This is where we show you how to take your hiking, backpacking, and camping gear and turn them into restorative props for a quick backcountry practice that will keep your adventurers flowing for as long as you can plan them. But this program has two camps: Yogi & Outdoor Adventurer. As you can see from the video above we aren't exactly in the backcountry hiking and this practice looks very similar to a yoga practice you might see in a studio. That's because we have also created new ways to extend your practice beyond the four walls of the studio out into the beautiful locations you adventure. The yoga camp will give you inspiration on how to use your gear for longer flows that will let you drop into your practice anywhere in the world. But if you are thinking, "I don't identify with yoga at all." The Outdoor Adventurer camp will provide you with gear uses and movements that can be simplified for quick muscle openers and alignment assists in the backcountry. For this program, you will only need to select 1-3 movements and hold them for 5-10 breaths to really begin seeing their benefits. This is perfect for the 3-day backpacking trip through the Grand Canyon or the day trek at your local state park. This is just Volume 1. We are working on Winter Sport Programs, Water Sport Programs, and so much more. And if you are a yoga teacher we have a special offer for a select group of teachers who would like to become a Camp Asana instructor. Inquire more by emailing us at info@youthryve.com. As an incentive for you Camp Asana exploration here is a coupon code you can use to save 20% off the program. Just type "CampKarma" into the coupon code. But don't wait too long, this code won't last forever. Use it in the next 30 days to get your deal. Make sure you sign up for our newsletter where will will also provide exclusive discount codes for our Camp Asana Yoga in a Backpack Card Deck coming out this fall and our Camp Asana adventure retreats. Let's get Wild and Go Forest Bathing-- great news you get to keep your clothes on. If you are ready to strip down the busy city life and step into the forest for a little recharge check out the benefits of Shinrin-yoku, forest bathing. Hiking is an amazing way to explore the world. But that doesn't mean that your shoulders, hips and low back are as pumped as you are about your 3-day, 30 mile, and 15,000 ft elevation gain excursion. That's why we want to give you five ways to improve your posture post backpacking. Butterfly pose is a great way to stretch your hips, groin, and low back. Holding this pose for just 5-10 breaths can help release tension you have been carrying on your back all day. Hammock Savasana is a clear favorite. It not only brings you into a more meditative state which is ideal for healing yourself on a cellular level, but it also helps rejuvenate your body. That's right you can take 10 years of corporate sales work away with just a few swings in savasana in the hammock. Okay, that's not exactly true. But it does create calm throughout the body. Half Frog Pose. While looking completely ridiculous, you should've seen the looks I got getting into the pose on the trail, it is great way to open your hips and release your low back. This is perfect post backpacking experience. Supported Fish pose is a great upper thoracic and shoulder opener. I prefer it on a squishy sleeping back to create something a little more forgiving. Downward Facing Dog. It's a full spine extension move that will make your spine feel so happy. Try all of these movements or 2-3 movements and hold them for 5-10 breaths. It's a great reset when you are backpacking far away from civilization and your local osteopath to adjust you. Epic Adventures require planning, a great group of friends, and yoga?